Raconteur Media (@raconteurmedia) recently published an informative insert for The Times of London. 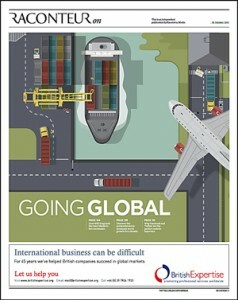 Going Global focused on UK exporters and exporting issues from their perspective. Social networks are key to penetrating export markets - but the networks can vary dramatically based on the market and demographic. It isn't just language - it's picking the right platform and using it correctly. Marketing localization is key. Ian Thurgood, MD, Wilkin & Sons on expectations "Exporting is definitely a long-term play. Don't rush into it. Do your homework and get to understand the market first. Go there and build relationships." The entire report can be downloaded here or read online here. US companies considering launching an export initiative or eager to improve their global business development should contact Consilium to explore how we can help.